Investors will open the new week with a fresh set of bank earnings and the possibility of more market volatility. U.S. stock futures were flat ahead of the opening bell with market sentiment trying to recover from last week's bumpy ride. The latest reading from the CNNMoney Fear & Greed Index shows market sentiment has swung into 'extreme fear' mode. All eyes will be focused this morning on Citigroup (C) -- the third big bank to publish first quarter results. JPMorgan Chase (JPM) shares fell Friday and were slightly lower in premarket trading after the bank reported first quarter revenue that missed expectations. Its earnings were also sharply down compared to the same quarter last year. Wells Fargo (WFC)also reported earnings Friday, but unlike JPMorgan, its earnings topped analyst expectations. On the economic front, investors will consider the latest monthly retail sales figures from the U.S. Census Bureau. Those numbers will be out at 8:30 a.m. ET. U.S. stocks closed in the red Friday, capping off a bumpy week. The Nasdaq was the biggest loser, falling more than 1.3% to end below 4,000 for the first time since early February. It lost 3.1% for the week. 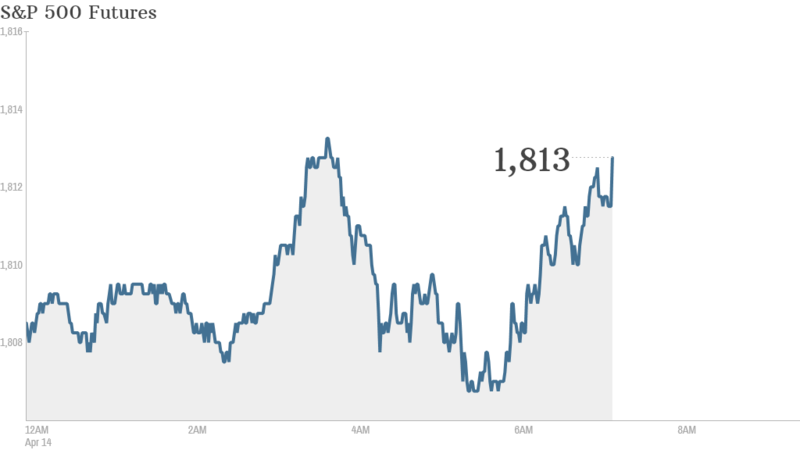 The Dow Jones industrial average fell 143 points Friday, sinking 2.3% for the week. The S&P 500 also fell, ending the week down 2.6%. European markets were all lower in middy trading as investors reacted to the Friday U.S. sell-off and the growing threat of U.S. and European sanctions against Russia. Russian stocks and the ruble dropped as the continuing strife between Russia and Ukraine ramped up to a fever pitch. Pro-Russian protesters seized a police station in Ukraine and the government threatened to oust them with a "full-scale anti-terrorist operation." "Even before this, the U.S. and Europe were threatening more sanctions as Russia forces remain amassed on the Ukraine border," wrote currency strategist Marc Chandler in a market report for Brown Brothers Harriman. "The position and weapons of those forces ... is leading NATO to conclude that Putin is seeking the full occupation of Ukraine." Asian markets closed with mixed results.